... Pteromalidae (Pteromalinae), a male. The 4-segmented tarsi helps distinguish this chalcid from the very similar pteromalid group. These wasps also shrivel up badly after death (note abdomen) which is also a characteristic of this subfamily. 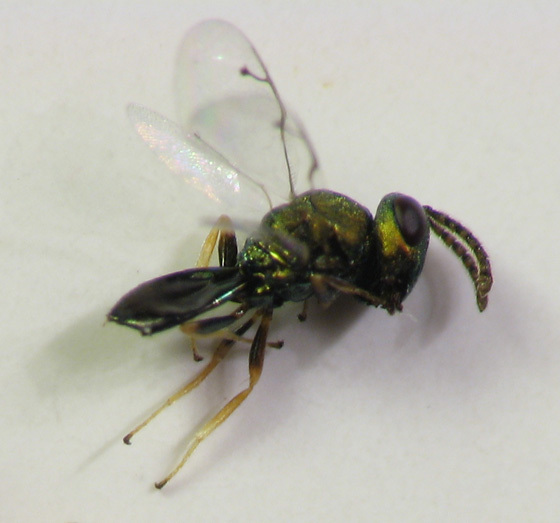 Most species are primary parasitoids of hidden larvae (e.g. leafmining orders such as Lepidoptera, Hymenoptera, etc. ), and some are hyperparasitoids as well. The host range is very diverse.